In an earlier essay, I explained that Zett’s Brewery in Syracuse, NY, with roots in pre-Prohibition brewing, was revived from 1933-1934. Genesee Brewing of Rochester, NY, mainly then owned and controlled by Louis Wehle, was a principal backer of Zett’s. During the initial run Zett’s focused on an ale, Zett’s Sparkling Ale, and later introduced a lager, Par-Ex. Zett’s was reorganized in bankruptcy proceedings in 1935 under the name Syracuse Brewery, Inc., still with Genesee ownership. Genesee injected $25,000 to cover operating costs for a couple of years. From mid-1935 until 1938 Wehle threw the dice behind ale again in Syracuse, this time with a Burton Union fermentation set and conditioning casks imported from Burton-on-Trent, England. Unions were installed in Syracuse at the former Zett’s. See further background in our post, here. Wehle intended his new ale to be a copy of Burton pale ale. He seemed to be using the old Zett’s as a hub, a hedge against a second act in Syracuse, assuming that is there was only one Burton unit. In 1938 Wehle marketed in various parts of upstate a similarly-billed Genesee Light Ale. Perhaps he had bought two Burton Union sets, one each for the Syracuse and Rochester breweries, as (see below) he was selling Burton Union beer in early 1935 in Rochester and upstate, it was initially called Old Stratford Ale. This was before the beer was made available to the public in Syracuse. However it worked between the two cities, this was no half-hearted effort: Wehle, a trained brewer himself, engaged as consultant no less than Briton Francis Moritz, scion of a noted brewing science clan. Wehle also brought a U.K. brewer, Arthur Vaughan, from Burton to Syracuse to supervise the brewing there (at least). Vaughan’s arrival with his fiancée, later wife, made something of a splash in the Syracuse social pages. It’s an extraordinary statement, as 1960 would seem the apogee of the light lager style. Why did the 1960 Wehle, now a lion-in-winter, think a true Burton beer would work if it didn’t before? Ballantine India Pale Ale was just hanging on in Newark, NJ as he had to know. To use the vernacular, America didn’t want to know from genuine ale, seemingly. One factor may have been the early growth of Heineken in America, a factor he had to notice. Perhaps he thought a quality English counterpart, brewed locally, would challenge this and other imports. In the end he was a visionary, obviously ahead of his time in the 1930s, and still believing in 1960 a true, British-style ale would fly in America. Of course it finally did, birthed by luminaries such as Fritz Maytag, Jack McAuliffe, and Ken Grossman (all CA), Joseph Owades (national + Canada), Frank Appleton (Canada), Bill Newman (NY), Bert Grant (WA), and Greg Koch (CA). The first image shown is from his book, This was my Life, that I profiled as stated. I highly recommend it to beer researchers and historians despite the difficulty to find it. The picture was taken during a trip to England in 1958. But Wehle states in the book he first visited Britain in 1932. He must have planned his new ale during 1934 as the first press ads and news stories we traced appear in early February 1935. The book states he bought the fermentation and storage equipment on the 1935 trip but clearly something similar was in place at the beginning of February 1935. Either he bought it before the trip, or he sailed overseas in fact in 1934, or he had a separate Burton unit initially in Rochester at Genesee. The book states that Moritz made several trips to America for Wehle, so I’d think he came in 1934 to help install the Burton Unions and have beer in place by the start of February 1935, possibly for the Rochester area first. Finally Arthur Vaughan arrived in Syracuse – this is documented – in May 1935 to operate the system there. Why did a German-American brewer have such an intense interest in British pale ale when he was from a town steeped in a tradition of lager or fizzy ales not so different from lager? In general, Wehle seems to have been an Anglophile, as the book is admiring of the countryside and other attractions of Britain, Ireland too. Also, as I stated earlier, when Wehle trained as a brewmaster c.1910, Burton still enjoyed a world reputation in brewing. This may have inclined him to an outsize appreciation for a (basically) non-American beer type. Further, Rochester’s Bartholomay Brewing and Genesee Brewing were owned by an English syndicate even before Wehle worked there between 1905 and 1918. He states in his book his family owned shares in the group. See this Genesee outline of the syndicate’s formation. 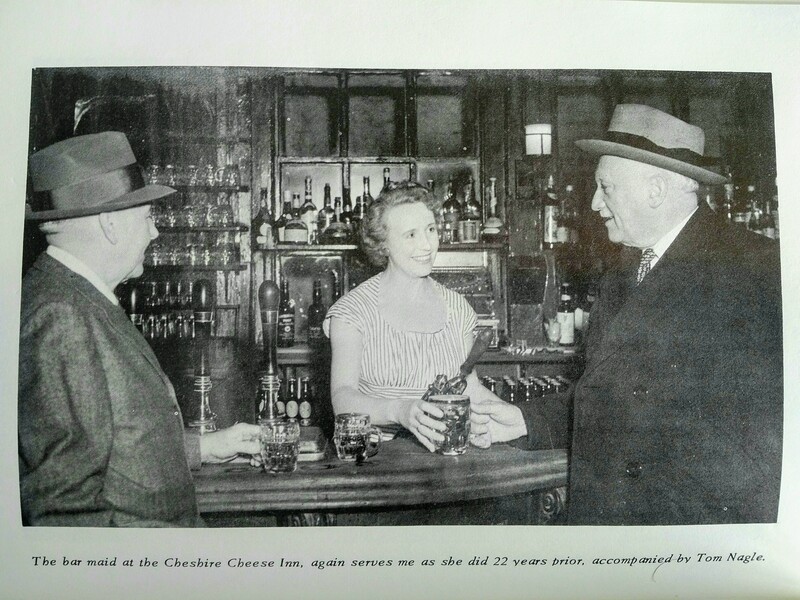 Wehle had surely met English representatives of the owners who likely discussed their native pale ale with him. Perhaps they had brought samples for the Rochester staff to try. Bass Pale Ale was always available in America but bottled Bass was one iteration of pale ale, matured and with secondary maturation flavours. It would not have tasted as Burton “running” pale ales. This surely is what Wehle sought to sell to consumers across upstate New York during Depression America. The beer shown with him in the Cheshire Cheese would have been that type, even if London beer. 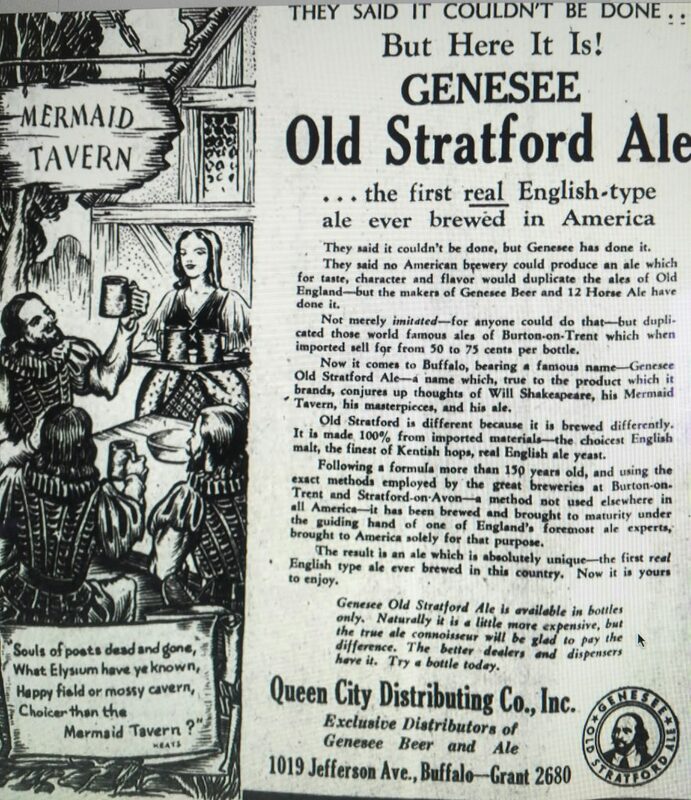 Initially Wehle’s beer was called Old Stratford Ale. 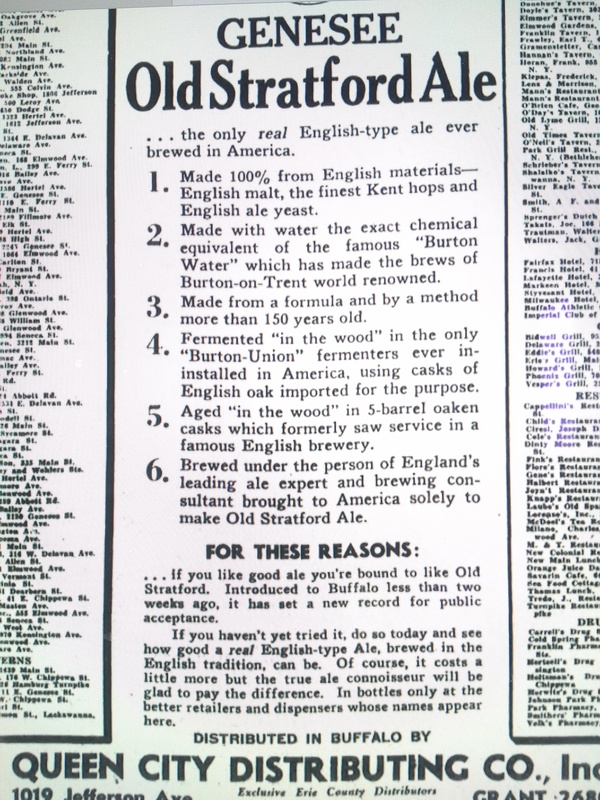 Detailed news ads of 1935 explained that all-English malt and (Kent) hops were imported, and English yeast was used. In effect Wehle did what those today do who seek to re-create a historic beer taste. It’s what I did with Amsterdam Brewery in Toronto earlier this year when recreating an 1870 AK bitter recipe. Old Stratford Ale did not take off, sadly. Wehle evidently re-named the beer for another try. 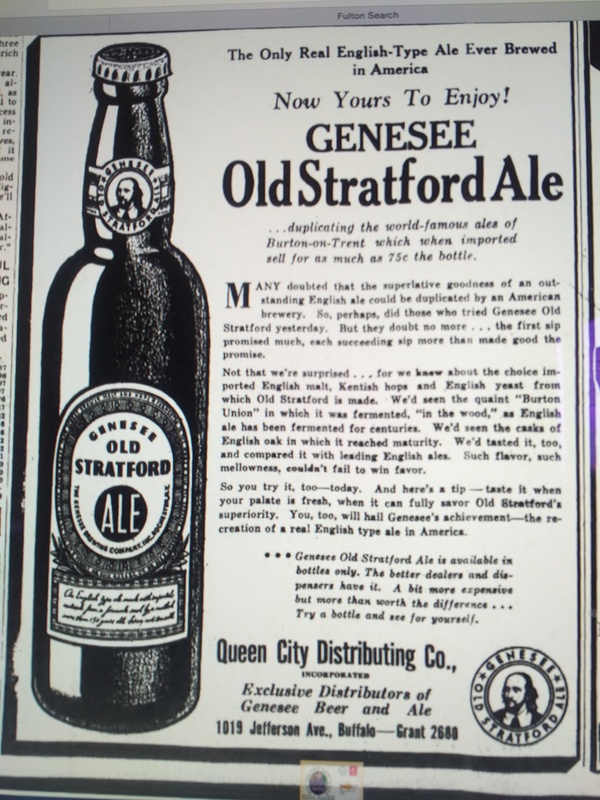 Ads for a similarly-made Genesee Light Ale appear through 1938, as I showed earlier. The Burton Unions must have been retired by the start of WW II, as Wehle states in the extract of the book above that he abandoned such brewing after a couple of years. It was more like four years. Perhaps Vaughan and wife went home, I don’t know. Wehle gave up finally on brewing in Syracuse but went on to consolidate a regional powerhouse in Genesee Brewing. He relied on both lager and sparkling ales such as 12 Horse and (finally) Genesee Cream Ale as the bulwark of his business. The book notes that N. Wesley Markson, head of sales in Syracuse in whom Wehle had great confidence, died at only 40. This was in 1937, we separately confirmed. The implication is this dealt that business a mortal blow. Markson is mentioned in the story linked above chronicling Vaughan’s arrival to brew for Syracuse Brewing, Inc.
“Genny” in Rochester is successful to this day, now under aegis of Costa Rican ownership. While a businessman to the core, Wehle had an evident affection for the old Burton India style. He wanted to make it the toast of New York State; that much is clear. He was a proto-Maytag, proto-McAuliffe, proto-Appleton. I salute him. 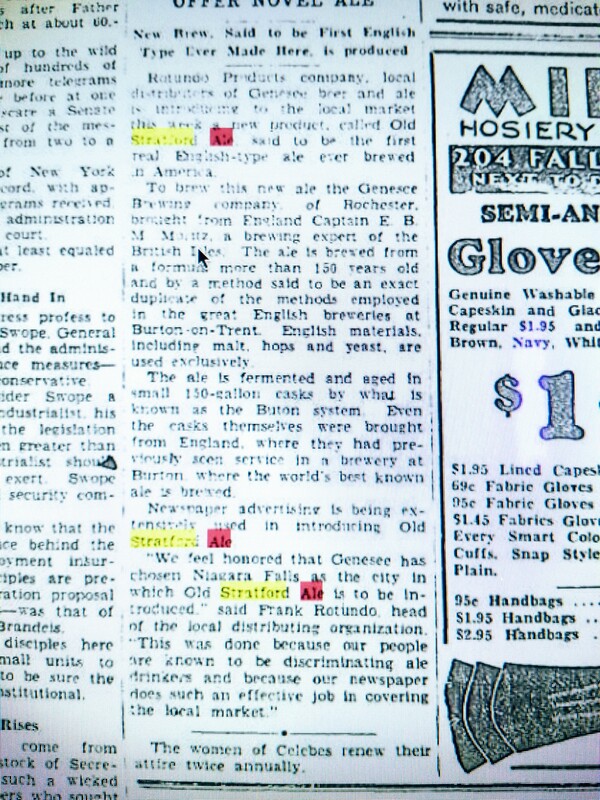 Note re images: The images above, except for the first whose provenance is noted, were drawn from mid-1930s searches in the Fulton Historical Newspaper archive. All intellectual property in the sources belongs solely to their lawful owner, as applicable. Images used for educational and historical purposes. All feedback welcomed.